Only eight original Palm Beach Mk2’s were manufactured between 1956 and 1958. 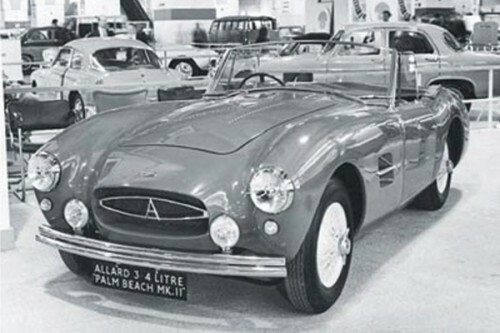 The first prototype which appeared on the Allard stand at the 1956 Motor Show had a Ford Zephyr 2.4 litre engine. 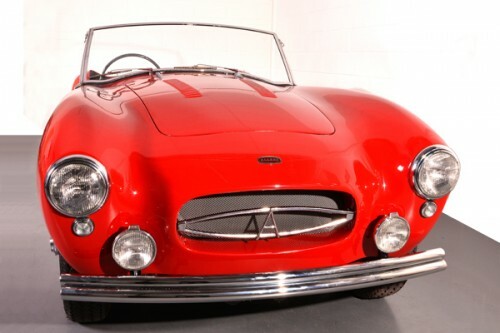 All the others were fitted with a Jaguar 3.4 litre engine, except for the last of the line, a closed GT model which was equipped with a Chrysler 5.4 V8. Of the eight cars manufactured, two were closed GT models (one was Sydney’s own car). The prototype Palm Beach has been recently restored by Allard Sports Cars and all the other cars are still in existence. Click here to follow the story or visit the galleries: before restoration and fully restored. Body: Two door aluminium with steel and aluminium inner panels. Painted dark red (similar to the original colour). Trim: Cream and red leather, with black carpeting edged in red leather. Steering: Right hand drive with Marles high ratio steering box. Engine: Fully rebuilt Ford Zodiac six cylinder in line. Capacity 2553 cc. Carburation by triple SU with six branch fabricated exhaust manifold. Fuel System: Twin tank arrangement with tanks mounted each side with the rear wing. Transmission: Ford four speed manual. Chassis Frame: Twin tube side members, braced with flitchplates and with both tubular and box cross members. Suspension: Telescopic shock absorbers with coil springs all round with twin trailing arms and panhard rod at the rear and forward mounted radius rods at the front. Divided front axle, Salsbury live axle at the rear. Brakes: Lockhead with 12" x 2 1/4" drums front and rear. Wheels & Tyres: Wire type, mounted on splined hub with centre lock spinner.